Shabam! And just like that, AUD/CAD hit my profit target. Only problem is, I never got triggered! The Aussie never really rose high enough to trigger my sell limit order at the 50.0% Fib. 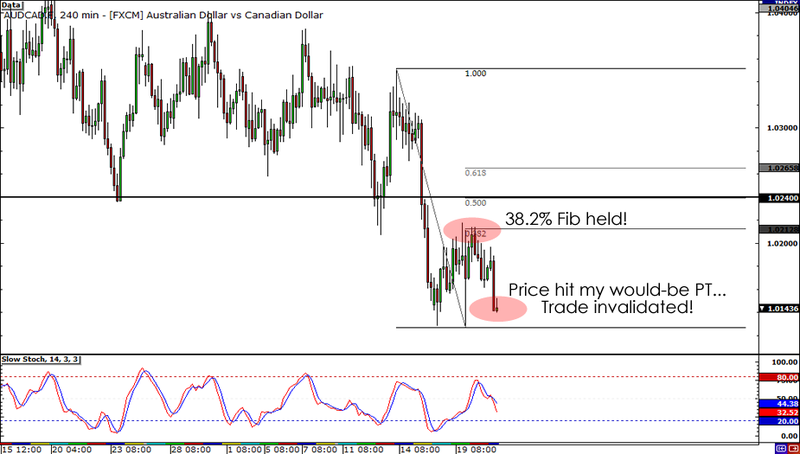 The minute it touched the 38.2% Fib, sellers said “That’s enough!” and pushed AUD/CAD back down the charts. Apparently, the Aussie has some serious wounds that need licking as its still reeling from the RBA’s dovish monetary policy meeting minutes. To make matters worse, yesterday’s soft MI leading index and today’s dip in the NAB quarterly business confidence report confirms that, indeed, the economy may benefit from a rate cut or two. In any case, it seems like AUD/CAD won’t be touching my entry point any time soon so I’m cancelling my orders for now. In the meantime, I’m considering if AUD/CAD is worth buying, now that its testing a former support zone. But at the same time, I’m feeling anxious about buying the Aussie, especially since AUD/USD is at a critical resistance level. Maybe it’s best I focus my attention on other crosses for now. Any thoughts or setups on other crosses you’d like to share? Yes, I know you must be thinking, “AUD/CAD? That’s an odd pair!” But given recent fundamental developments, I think it’s worth taking a look at this pair. As my homegirl Queen Cleopiptra has said, recently, the Reserve Bank of Australia and the Bank of Canada have expressed divergent views on their respective monetary policies. Minutes of the latest RBA meeting revealed that RBA policy makers are leaning toward the side of caution, and will most likely not be raising interest rates any time soon. Some even see a rate cut on the horizon. It will most likely take a strong surge inflation before RBA Governor Glenn Stevens and the boys from the Land Down Under consider another rate hike. Across the Pacific though, it seems that BOC officials have shifted their stance with regards to monetary policy, and could raise rates sooner rather than later. According to yesterday’s rate statement, the central bank wants to keep inflation in check and remains upbeat over the state of the Canadian economy! This divergence in interest rate speculation seems to have taken its toll on AUD/CAD, which finally broke through a key support level. After ranging for the better part of the last few months, the pair finally broke through support around 1.0230. Now that the pair has retraced a bit, I think there’s a chance that this area could serve as a support-turned-resistance point. Now, instead of jumping in right away, I’m going to wait for Stochastic to hit overbought conditions, and for price to test the 50.0% Fib level at around 1.0240. Bearish divergence already seems to be forming, and an entry point around that price level will give me an ideal reward-to-risk ratio. I plan to put my stop above the 61.8% Fib level, at 1.0290, while I’m setting a modest profit target at the recent lows near 1.0150. 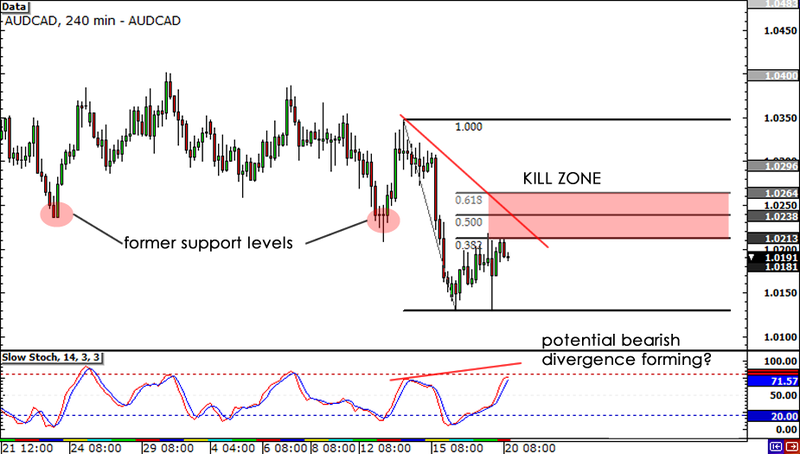 Short AUD/CAD at 1.0240, stop loss at 1.0290, take profit at 1.0150. This looks like a solid trade to me, as both the fundamentals and technicals line up nicely. Hope everything plays out as I expect! Anyone out there who plans to join me? Gimme a shoutout on Twitter or on Facebook and lemme know which cross pairs you’re planning to trade this week! Do you normally trade AUD/CAD?